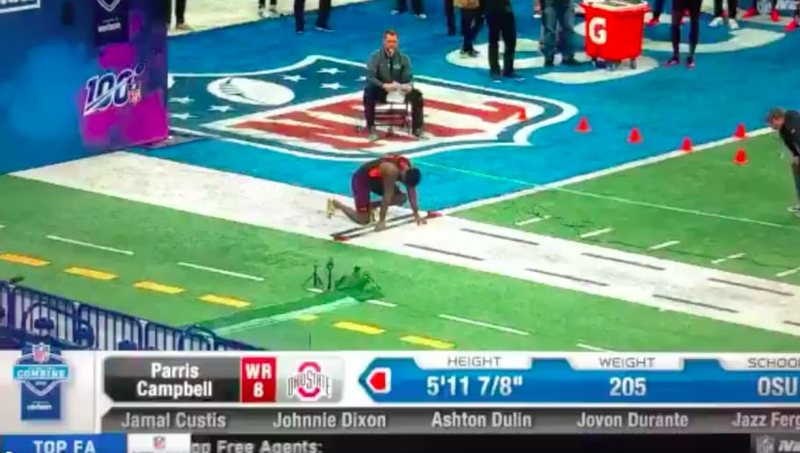 ​Ohio State Buckeyes wide receiver Parris Campbell, who is seen as potentially the fastest receiver in the 2019 NFL Draft, ran a ridiculous 4.32 on his first attempt of the 40-yard dash at the NFL Combine on Saturday. #OSU WR Parris Campbell with a 4.32u on his 1st 40 attempt. Campbell's time of 4.32 is the fastest of the wide receivers currently and tied for the second fastest ​Buckeyes' time ever. But it looks like we have a new leader after the update! He had a great campaign for the Buckeyes in 2018, racking up 1,063 yards and 12 touchdowns, which already made him a high-ranking WR prospect heading into the draft. Campbell's stock has been hurt a bit due to drop problems, but at 6-0 and 205 pounds, his size and speed combination will attract many teams. ​Campbell certainly had some extra motivation heading into the 40-yard dash as he was not listed as one of the fastest players in college football last summer. He even has a custom T-Shirt making fun of this list -- too bad he didn't wear it during this run. How does @PCampbell21's speed stack up with three of the best WRs in the NFL? If he remains the fast wide receiver at the combine, don't be surprised if Campbell starts rocketing up draft boards.